Easter is probably my favorite day of the entire year. As a Christian, there’s no better day to celebrate. Our God is alive! I always love the Good Friday service and the Easter sunrise service. I enjoy the family time and most of all the reflection on what Jesus did for us. How profound that the High and Lifted up One, Jesus, would become low and humbled and die the lowest most inhumane form of death possible. As I thought and pondered and prayed about what I’d teach on this year – my first Good Friday and Easter actually getting to preach – I kept thinking of two verses in John. Jesus’ death was no accident. It was premeditated. Normally, the word “premeditated” fits into the context of a murderer planning out the murder before actually pulling it off. That certainly happened with Jesus – all throughout the Gospels you can read about the Jews planning to kill Jesus. Judas also had it all planned out – down to the kiss. Those parts are interesting, but there’s something even more intriguing to me. It’s the fact that God the Father and Jesus, His Son, also had it all planned out – it didn’t take them by surprise like a normal murder would. The animal that had to die in Genesis 3 so that God could make a tunic of skin to cover their nakedness – that sacrifice pointed to Christ. Abraham almost sacrificing his only son, Isaac – that pointed to God giving His only Son. The book of Leviticus – a gory, gruesome book focused on bloodshed and slaughter pointed toward Christ and His death. The Psalmists wrote of Him. The angels even announced Him as the Savior. He was born to die. As sinful and deceitful as Jesus’ enemies were in betraying Him and killing Him, they were all just a part of God’s master plan! Jesus’ death was the sacrifice of all sacrifices. There would never again need to be a lamb that was slain, a bull burnt, or a goat that was sacrificed. Jesus took it all for us…BECAUSE HE WANTED TO! Incredible! 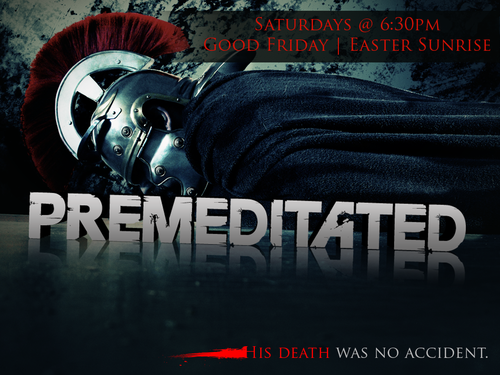 Over the next 4 weeks leading into Good Friday and Easter, I’m going to be teaching 5 messages that go with this theme: the PREMEDITATED death of Jesus Christ and the resulting salvation that’s available for all mankind. Jesus’ death wasn’t an an accident. He died for me and He died for you…because He wanted to. I pray you’ll bring some friends over these next few weeks as we dive into this amazing topic. We’ll be discussing events that were life-changing and world-shaking when they took place and my prayer is that they will be eternity-changing as we re-live them once again. Hope to see you and some friends there!